Submitter: This is a “sensitive” story about Rita who is overweight. 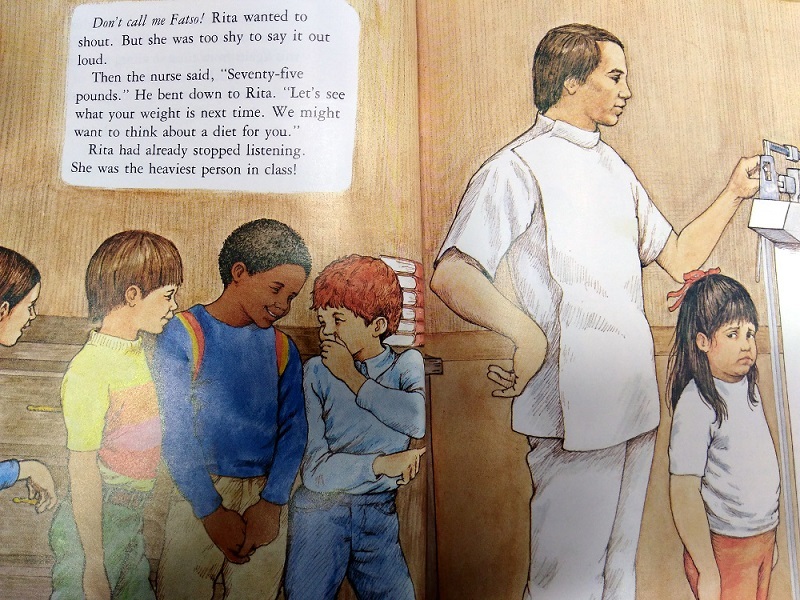 Rita has to face being weighed in front of her entire class and being told she needs to go on a diet. She then is bullied by her classmates in art class and swim class. She uses food to deal with her emotions. But after some effort, Rita finally looses weight where she is told she is a healthy girl and no one bullies her anymore. 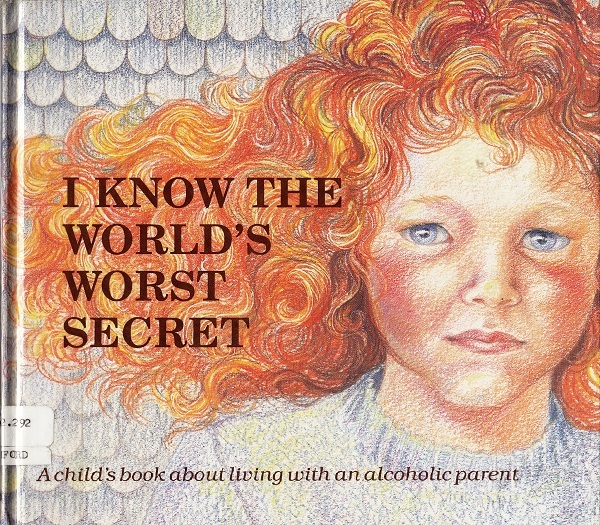 This book came to our attention after a horrified story time mom found it on the shelf. The book has not circulated in at least ten years. I took the time to read the book and the story has a lot of mixed messages. Childhood obesity is certainly an important, but complex topic, that would be difficult to tell in a short children’s story. A lot of things are glossed over like bullying and self-esteem. The doctor says she needs a diet at one weight and then after losing only 5 pounds she is suddenly healthy. 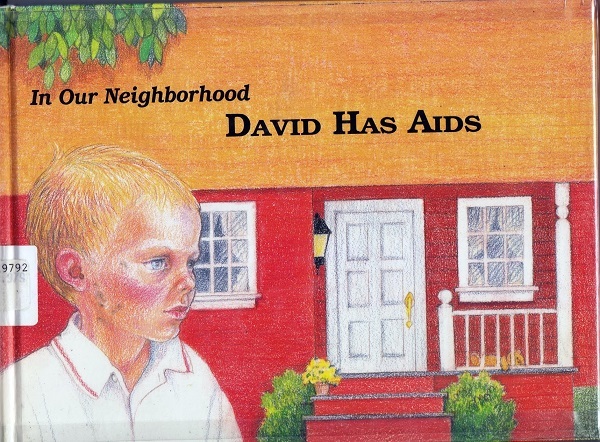 I don’t know how one writes a book for kids on this topic, but this one is not it. 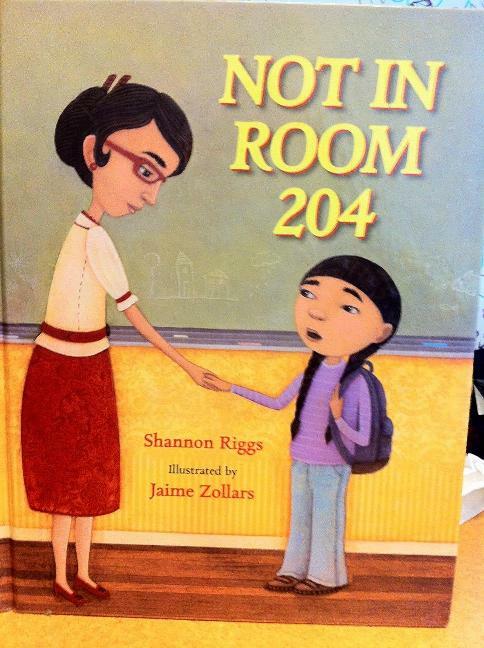 Holly: Books like this bother me more than just about any other thing. Jennifer Jean the Cross-Eyed Queen got her eyes fixed and suddenly had friends. Maggie went on a diet and suddenly had friends. Make it stopppppp! Yeah, the concept that you can get rid of bullying by making the “different” kid not so different anymore is horrifying and far too common. These day’s it might be all the fat kids giggling at the thin ones. 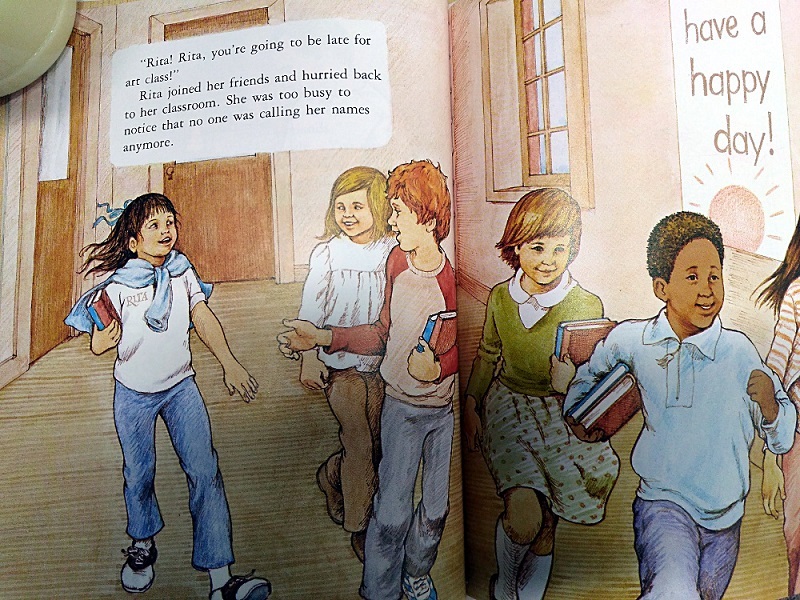 At least the teacher tells the bullies off for drawing those pictures of Rita. But still the message, as usual, is that people really only like you for what you’re like on the outside. I just have to say that your “then again” comment has made my day 😀 Make room in that prison for me! Yeah, that’s what they told me when was bullied as a child, if you just dressed like everyone else and acted like everyone else and didn’t let any one know about your learning disabilities then you wouldn’t get teased. It didn’t work. 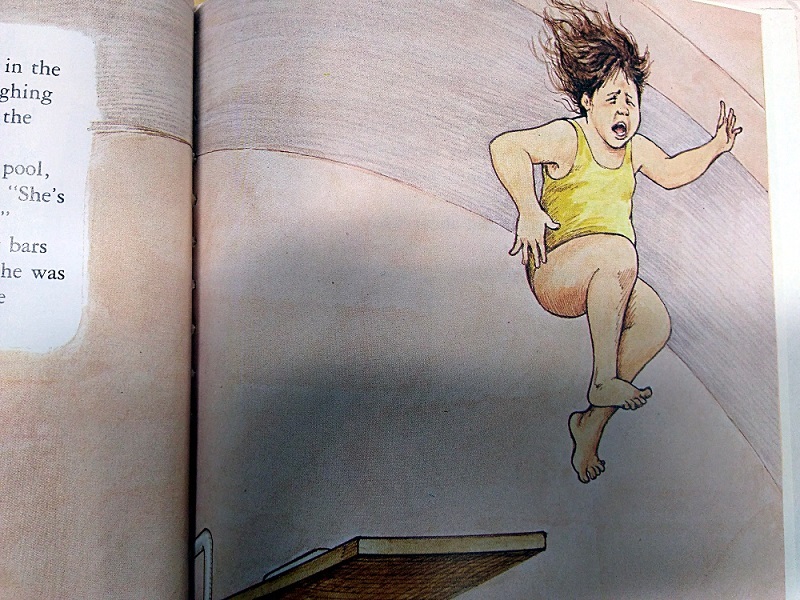 First of all, I HATE it when in a kids book of this kind they include an actual weight. What if a kid is reading this weighs 75 pounds, close to 75 pounds, or more than 75 pounds? They are going to automatically feel bad and think they need medical treatment for their obesity, whether or not they are actually overweight for their height and age. 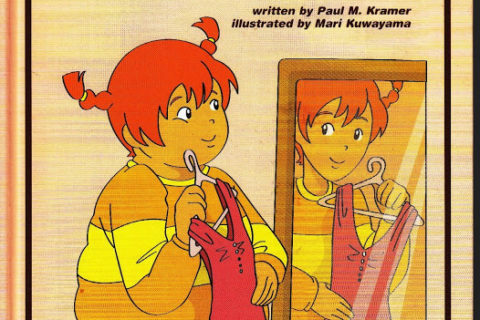 Second, I wish these books would be less about losing 5 pounds to fit in or getting your eyes fixed or whatever and more about the fact that NO ONE has the right to make you feel uncomfortable or inferior, no matter your situation. I was so used to bullying as a kid that it took me a while to see that it was actually wrong and not my fault for not conforming or adequately standing up for myself. I have hope that people are more sensitive these days. Now the focus is more on educating the bullies for their behavior rather than sending the victim to the school counselor because he/she is not making friends. 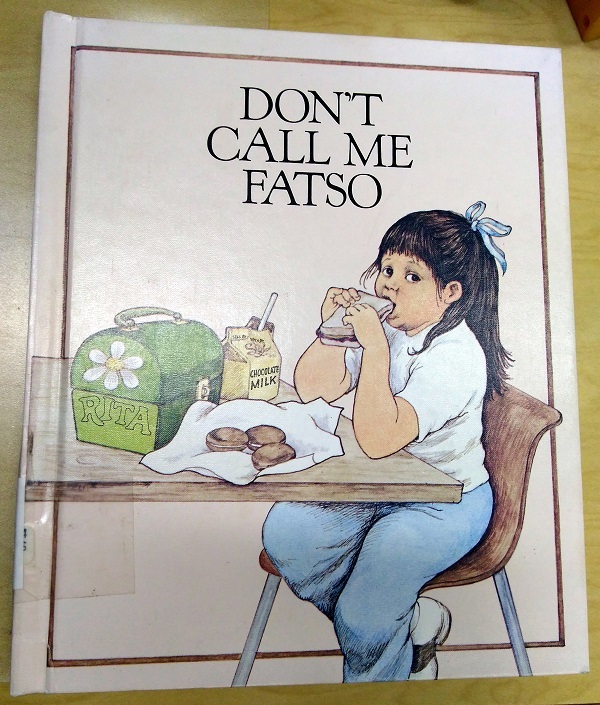 Books like these serve as a reminder (see also Fatso Jean the Ice Cream Queen) of a time not so long ago when we taught kids that they had to look or act a certain way to be deserving of respect. Being healthy and at a healthy weight (though an “ideal weight” IS somewhat ambiguous) is important, but these books send the wrong message. A) Being bullied is your fault. B) Changing will instantly make bullying stop. Also, why is the (doctor? Teacher?) weighing the kids in front of each other and discussing (supposed) medical treatment for all to hear? Also, the character’s dialogs and the illustrations make it seem like these kids are about 8-10 years old. Is 75 lbs. really that bad for this age group? 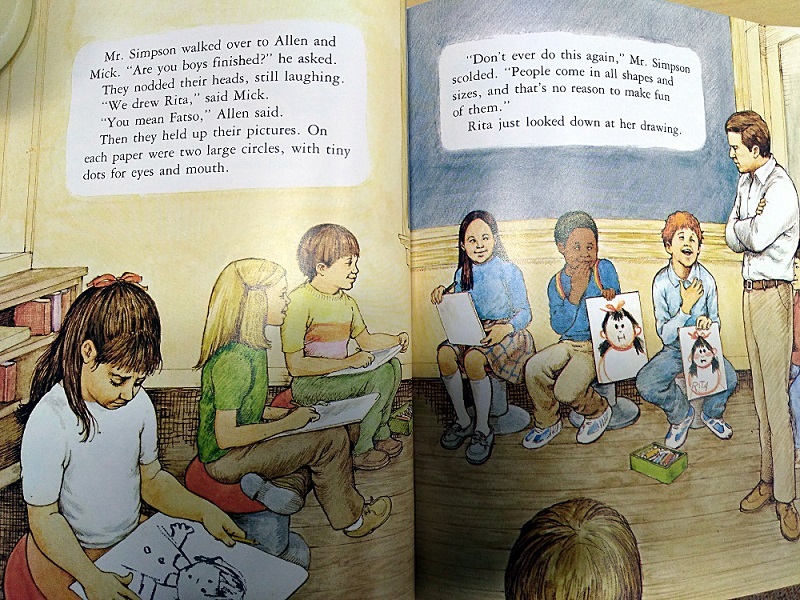 This was in my primary school library along with another in the same series about a young boys grandpa dying…no punches were pulled. Trump is your President. Fatties are unhealthy and disgusting and abnormal. Message: Conform, and you’ll be fine.